With 32 percent fewer traffic accidents involving children, Seoul, South Korea is one example of how changing street design can improve road safety. When you consider the global statistics, it’s no surprise that this year’s U.N. Global Road Safety Week focuses on children’s safety. According to a 2008 World Health Organization (WHO) report, 21 percent of all road traffic-related fatalities worldwide were among children under the age of 18, and traffic injuries were one of the leading killers of children under 20 years old in both high- and low- to middle- income countries. The typical discussion around children’s traffic safety is a behavioral one, focusing on issues like helmet- and seat-belt laws and drinking-and-driving laws. While these policies can definitely generate impact, they’re not enough to make streets truly safe. Countries and cities around the world should embrace a “safe system” approach that goes beyond behavior-targeted policies and actually makes cities safer by design. Urban design and street features can help make cities safer. “Traffic-calming” measures (such as speed bumps) and urban design features (such as shorter block lengths and narrower streets) can slow down vehicles—a benefit for pedestrians and cyclists of all age groups. Children use streets in a variety of ways, for walking, biking, traveling in cars, or simply playing. Yet they’re even more vulnerable to traffic collisions than adults given their lower eye level, narrower peripheral vision, lower capacity for decision-making, and tendency for sudden action. So it’s especially critical to reduce vehicle speeds in areas with lots of children. 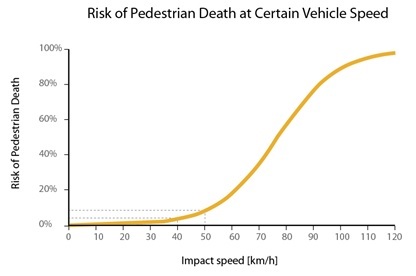 This graph shows the relationship between impact speeds and the chance of pedestrian death. When collision speeds rise, pedestrians’ survival chance drops dramatically. Source: Rosen and Sander 2009. 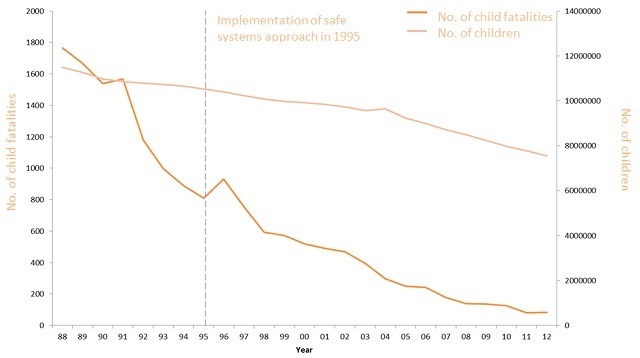 One success story of safe design comes from South Korea. Traffic-related fatalities among children fell by 95 percent in the country, from 1,766 in 1988 to 83 in 2012. This success was the direct result of a suite of projects that targeted regulations, education and the built environment. 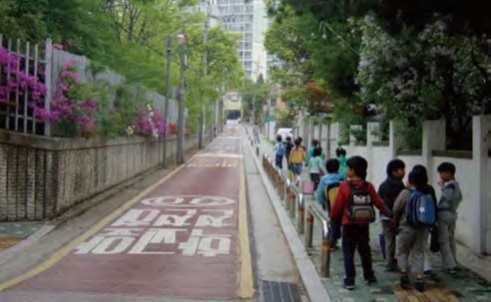 This narrow street in a school zone in Seoul has a clearly marked roadway (here translated as “school zone – slow down – 30kmh”) and sidewalk protection fences, creating a safe walking environment for children. Photo by Seoul’s Seocho District Office. One such project was the School Zone Improvement Project, implemented throughout several Korean cities. The Project aimed to create safe routes from children’s homes to kindergartens, elementary schools and childcare facilities. Officials started by reducing speed limits through infrastructure design tools, such as speed bumps. They established dedicated right-of-ways for pedestrians, and created clear distinctions between sidewalks and roads. New fences further protected children from road hazards. City officials also installed traffic signals and speed limit signs within 300 meters of a school’s main gate, and painted roads within school zones with messages such as “school zone” and “protect children” so that drivers would proceed with caution. And finally, they banned street parking on roads leading to schools’ main entrances, reducing the potential that vehicles and children could come into contact. The School Zone Improvement Project produced very positive results. The measures led to roughly 32 percent fewer traffic accidents involving children each year. Combined with comprehensive measures such as traffic safety regulation, school bus operation and civil activities, Korea has successfully reduced its child traffic fatalities by 95 percent in a little more than two decades. A city designed for children must have streets that are safety-oriented, particularly in buffer zones around playgrounds, parks, schools, community centers and other kid-centric places. The successes of programs like those in South Korea teach us how strong leadership can establish ambitious targets, acquire investment, implement programs and generate impressive results. South Korea is not alone in designing safer streets. Cities like Stockholm, New York and Amsterdam are also taking actions to improve road safety. Leaders in other cities should take note: If planned and designed with society’s most vulnerable members in mind, our cities and roads can be safer places for everyone.